I’ve never read anything by Murakami before. He’s one of those authors that scares me, probably because a long time ago I heard a rumor about some sort of animal brutality in his book Kafka on the Shore. I’m not the sort of person who likes to read vivid descriptions of any sort of brutality, so I have avoided his books. But Jenners talked about this short memoir, and it sounded like something I would enjoy. Running and writing novels, paired and compared. I started writing very young, in my childhood, and got serious about it in my 20s. I’ve written many, many novels now, two of which are in good, query-ready condition. Up until 2006, I had never considered writing a novel, and had focused on short stories for most of my life. But in 2006, I decided to try, and I’ve gone through the painstaking, rigorous novel-writing procedure many times now. I love it, and I can definitely understand when Murakami likens novel-writing to long-distance running. I am not much of a runner, and never have been, but I have been trying to get better at it since August of 2010. In the last few months, I finally got to where I can run a full 5K, even though I’m ridiculously slow at it (around a 14-15 minute mile pace). I enjoy running. I’m looking forward to the day when I can run faster, and longer, than I can now. And again, I can see why Murakami compares running and novel-writing. They really do have some strong similarities. This was an enjoyable book, particularly in the first half. 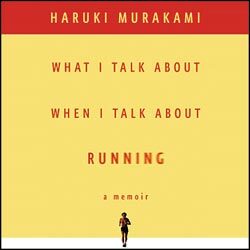 Murakami got me more excited about running, and made me think about setting up schedules that focus not on distance or speed, but just time spent running. But from the beginning, he also warns that this book is not a how-to on running, or even an attempt to persuade others to run. He’s just talking about how running has influenced his life, and the way he approaches the sport. These warnings are good, because the second half of the book sort of curbed my running enthusiasm, as he went on to talk about grueling training sessions and ultra-marathon races. I don’t see myself ever wanting to run a marathon, much less a 62-mile (or longer) ultra-marathon, and Murakami’s training schedules seemed a bit…extreme. I think for myself, I would prefer a more moderate approach! Still, it was a good book to read, and I’m glad to say I finally read a book by an author who really does terrify me. Performance: This audiobook was read by Ray Porter, who is a new-to-me narrator. He did a fine job. Nothing spectacular, but I have nothing negative to say either. This entry was posted in 2012, Adult, Prose and tagged Asia, audio, fitness, nonfiction, POC, translation. Bookmark the permalink.